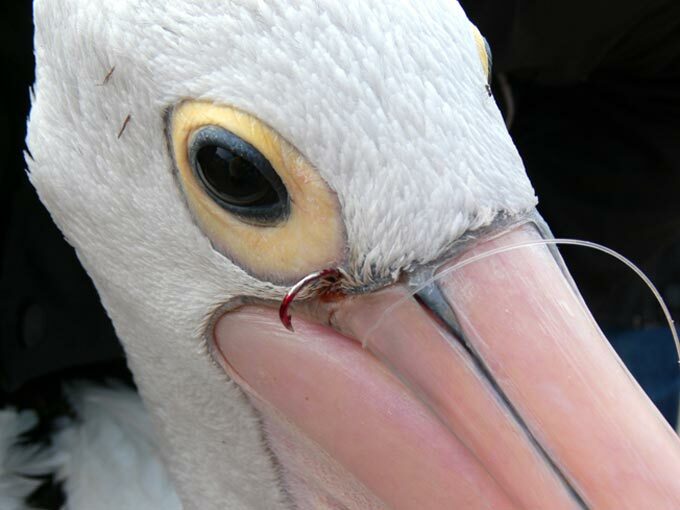 This pelican was very lucky the fish hook missed its eye. Seen in the picture at right it’s being fed a ‘good bye’ mullet after spending a night in hospital having the hook removed. The bird made a full recovery. 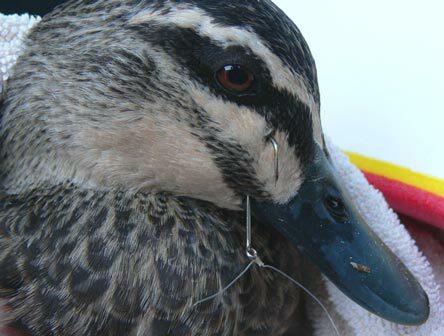 This Pacific Black Duck was hooked by a fisherman who didn’t report the injury. 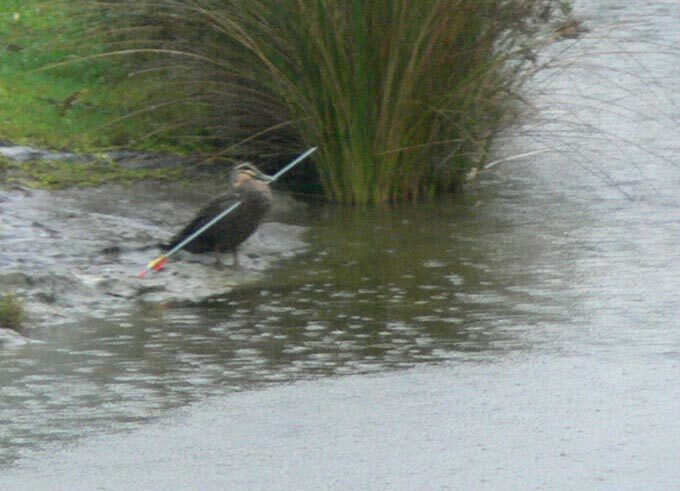 Fortunately a passer-by spotted the bird swimming in a lake and called for help. 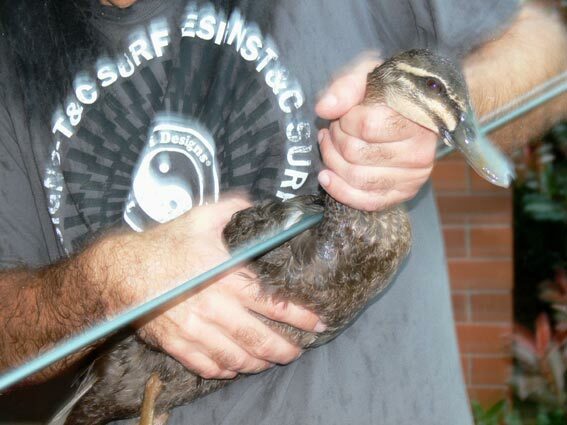 The duck was caught; the hook removed and it was safely returned to the water. 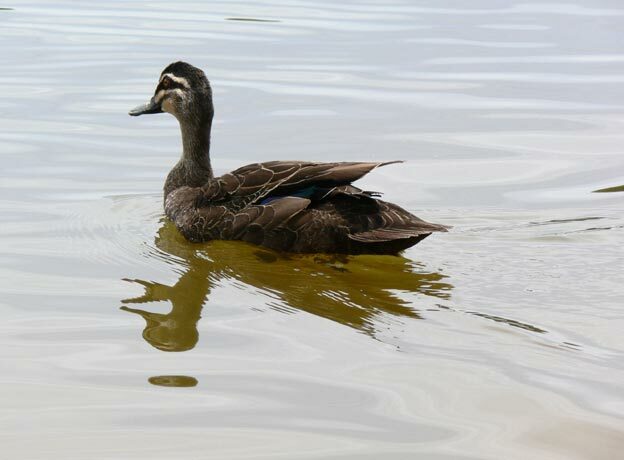 Someone had shot this Pacific Black Duck through the neck with an arrow. Fortunately deliberate cruelty is uncommon in this area as all wildlife is protected. The injury hadn’t prevented the bird from flying. It had traveled many kilometres with that 85cm (3ft) arrow shaft protruding either side if its neck. It took me a week to track the duck down and catch it. 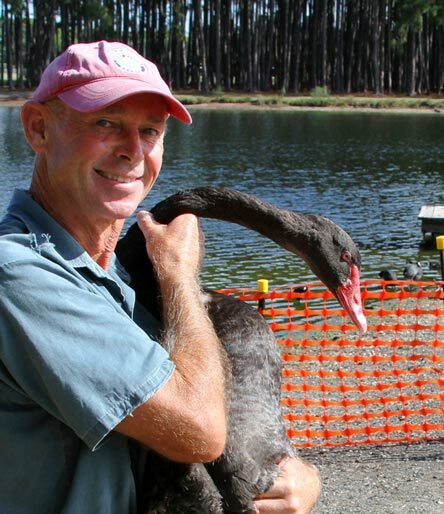 When we arrived at the wildlife hospital the vet nurses named it ‘William Tell’. I don’t know how that arrow missed the duck’s spine and vital blood vessels, but thanks to a lot of luck and great veterinary work it made a full recovery. I released William after spending only one week in hospital! 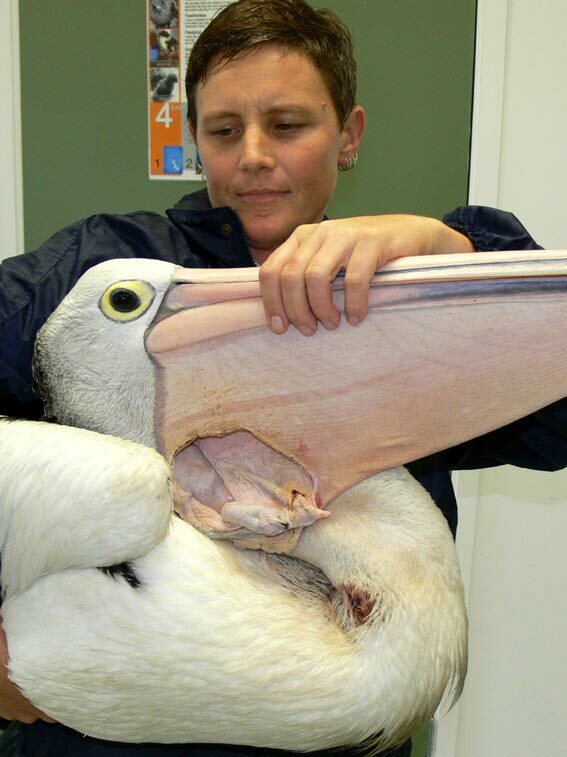 ‘Jake’s’ torn pouch is consistent with injuries that occur when a pelican gets hooked by a heavy fishing line and then tries to tear itself free. 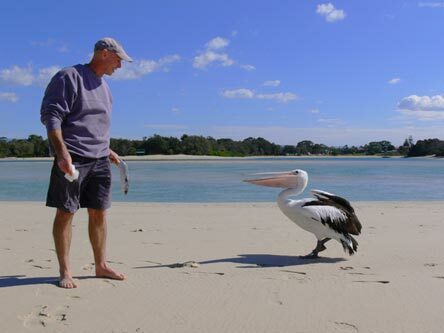 Every time Jake attempted to swallow a fish it would slip out through the hole in his pouch and be stolen by another pelican. He would have soon starved to death. Jake could still fly and so it took me a couple of days to find him. He was rushed to hospital where more than 100 stiches were applied internally and externally to repair his torn pouch. Jake made a full recovery and was released after 15 days. This cormorant had been hanging 6 meters (20ft) above the ground, lashed to a branch by fishing line attached to a fish hook in its ankle. It’s hard to imagine the pain the bird must have endured. For the rescue we used a very long swimming pool pole with a saw taped to the end. Judging how much of the branch to cut off was important – too much and the bird would crash to the ground – too little and it might fly away before we could catch it. 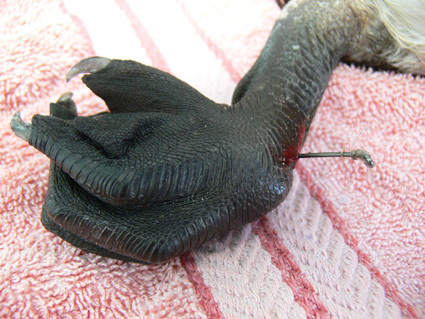 The cormorant had a vicious hook (left) buried deep in its ankle. It was taken to hospital where it was anaesthetised and the hook removed. 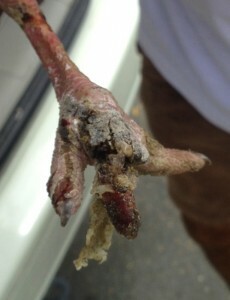 The creature was very fortunate to survive this ordeal and retain the use of its injured foot. Happily it made a full recovery and was released 10 days later. 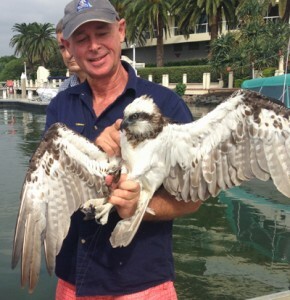 For two weeks I’d been getting reports about an osprey flying around with a large ball of fishing line tangled between its legs. ‘Flight capable’ ospreys are very hard to catch. Up until then the bird hadn’t given me an opportunity. 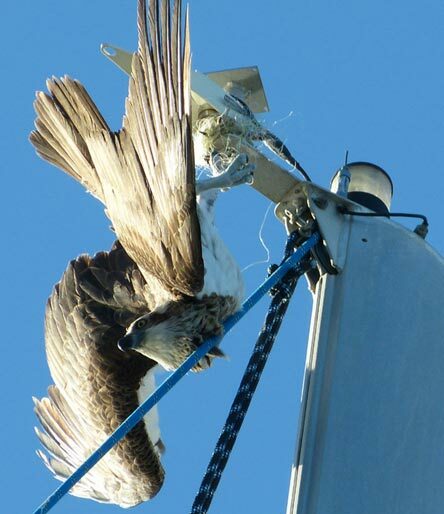 Eventually the inevitable happened when the osprey landed atop a 15 meter (50ft) high yacht mast and the line became entangled in masthead fittings. The yacht was unattended and the owner lived many kilometres away and so it was many hours before we could get to the bird. In the meantime it hung upside down, only managing to right itself occasionally. 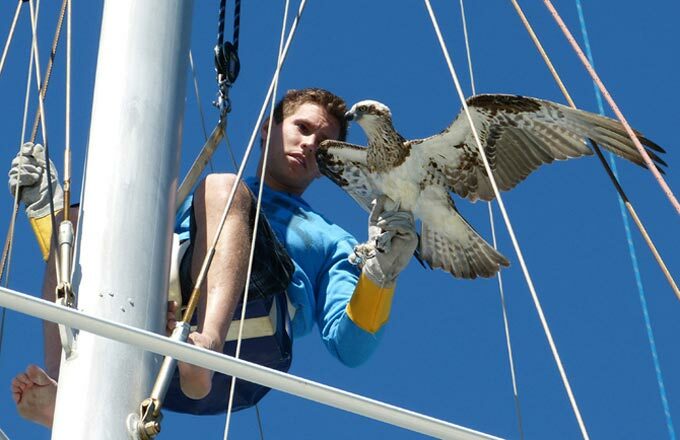 A rescuer was winched up the mast to cut the bird free. 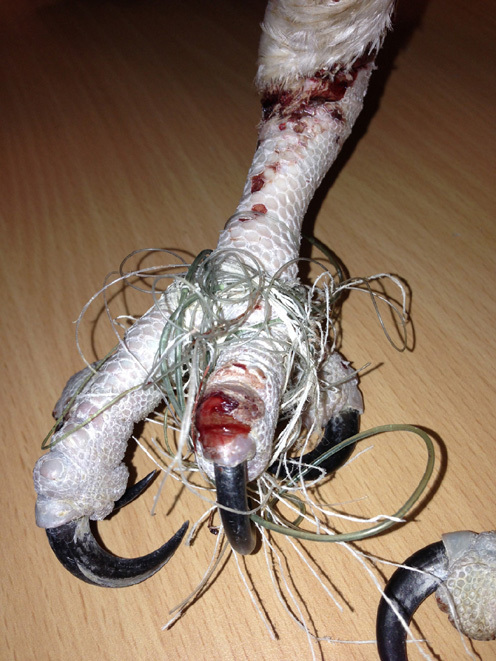 We found several different weights of fishing line wrapped around the bird’s talons. Unfortunately this osprey did not survive. It died a day after being rescued – probably because it had hung inverted for too long. This was a great tragedy as she had only recently found a mate and together they’d set up a nest on a local tower. For four lonely months he maintained a vigil on the tower, awaiting her return. Yesterday there was a new development. 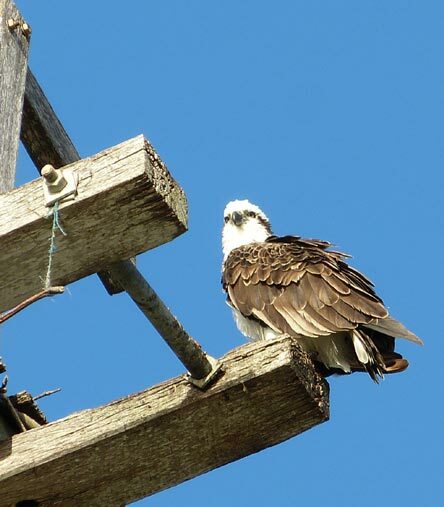 I was delighted to see that another osprey had recently arrived. Judging by their aggressive defense of the nesting tower against marauding crows it looks like the birds have already paired up and mating could be taking place. Fingers crossed! Update. 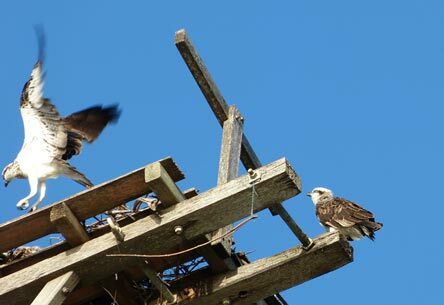 In June 2014 the pair hatched 2 chicks. One survived and fledged in November. All three are still together. The parents are training him in the fine art of fishing! In December their nest was blown away in a storm. Very lucky there was no young in it at the time. When they’re ready the parents will rebuild and start a new family. Update. On the morning of March 20th, 2015, I captured and disentangled one of the ospreys from the tower after it became caught in fishing line while swooping to grab a live fish from the water. 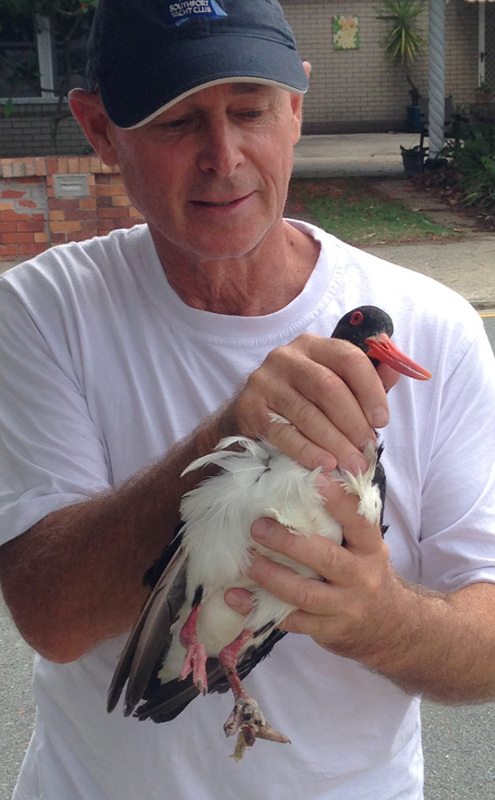 The bird was caught; freed of the line and released immediately, unharmed. 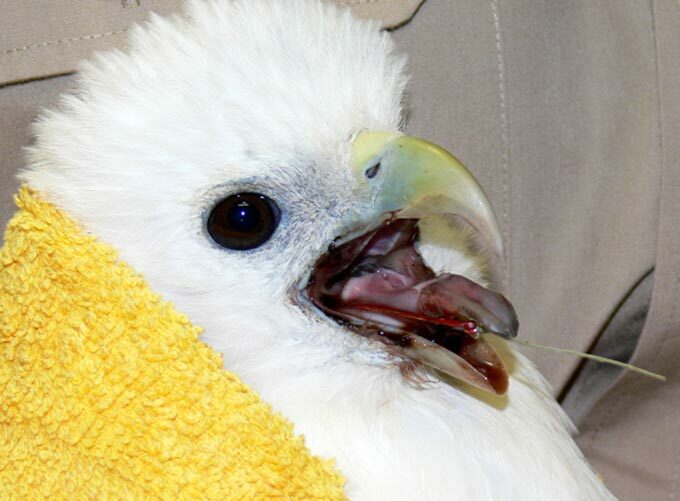 This young Brahminy Kite had swallowed a bait and got the fish hook caught in the back of its tongue. 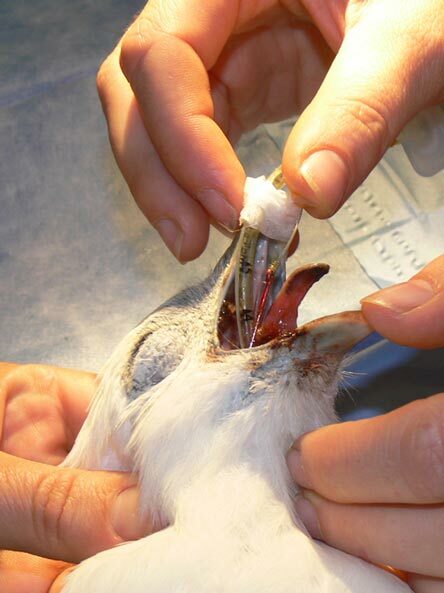 At the wildlife hospital the bird was sedated to allow caring hands to insert a breathing tube before removing the hook. The kite made a full recovery. Grace, as we called her, had been attacked by a dog. 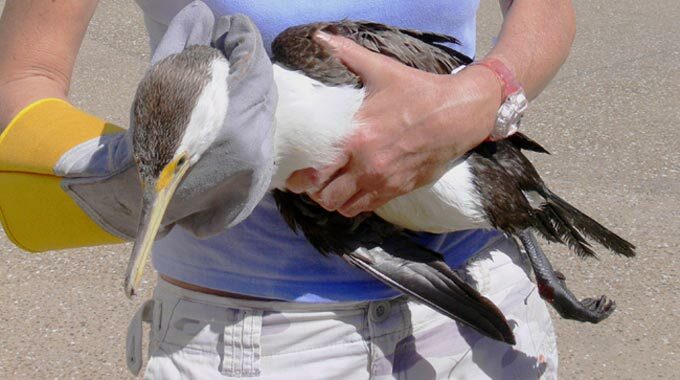 She’d suffered damage to the muscles and tendons of her right wing, which can be seen dragging on the deck. 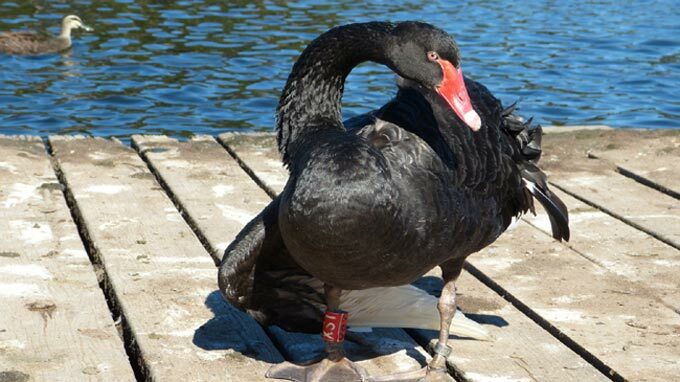 Grace was the fourth swan to be attacked in Pizzy Park, a ‘dog off-leash’ area, during the previous eight months. Most attacks were thought to be caused by one dog owner who was being irresponsible with her dogs. I caught Grace and took her to hospital where she made a slow recovery. She was very lucky because this type of injury is often irreparable. Her wing healed well but was still a bit droopy at the time of her release. Some months ago I noticed that Grace has moved to The Botanic Gardens in Ashmore. She has paired up with a smaller swan meaning that Grace is almost certainly a male and therefore has been appropriately renamed Graham. You can find the pair most day swimming on the lake in The Gardens. Graham is the larger of the two and has a slightly droopy right wing. Otherwise he’s doing great. 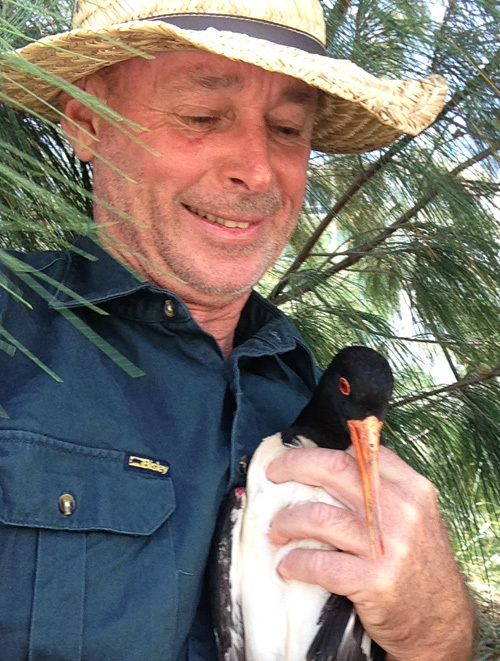 Cindy is a pied oyster catcher … a semi threatened species and one of my favourite birds. She was seen limping and being bullied by other oyster catchers. A closer inspection through binoculars revealed that something was very wrong with her left foot, although exactly what that was I couldn’t tell. So I set about trying to catch her. Oyster catchers are very standoffish and catching them is no easy task, but after three days hunting I managed to blow a net over Cindy. Her foot was in dreadful condition. Even the vets were baffled when they saw how the skin and bone was disintegrating. She was in serious trouble. 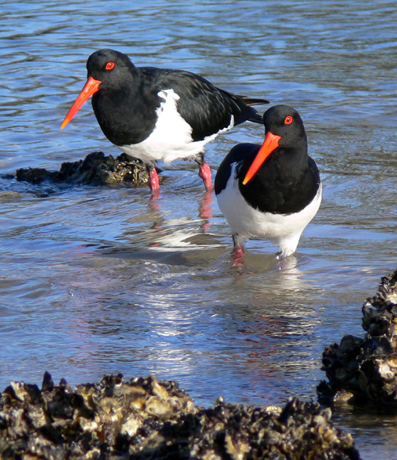 Oyster catchers are relatively light weight birds and can still survive even when they only have one leg, although this makes their life difficult. I thought Cindy’s only hope would be a full amputation above the knee. Luckily I’m not the one who makes those decisions. 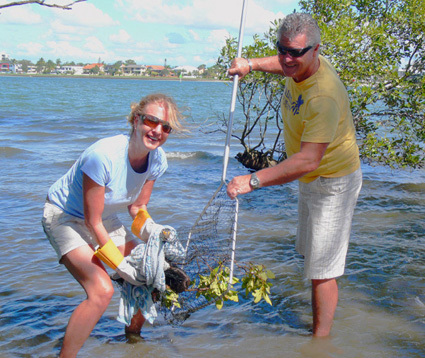 The vets at Currumbin Wildlife Hospital worked on Cindy for 8 weeks. She needed a number of operations to amputate the toes on her left foot but managed to retain the stump. This is a very good outcome. Eight weeks is a long time in hospital … roughly the equivalent of twelve months for a human. Oyster catchers are very expensive to feed and as their name suggests they love oysters, prawns, mussels and other costly delicacies. She nearly sent the hospital broke. It was touch and go whether Cindy would survive but in the end, thanks to excellent veterinary work and nursing, she made it. The stump of her left foot healed well. 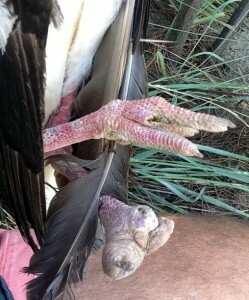 This is a far better outcome than amputating the leg. Upon her release Cindy ran straight down the beach and into the salt water of the Broadwater then began washing furiously, no doubt keen to shed herself of the smell of such a long period in captivity. She showed no signs of imprinting and is still a wild bird. After a thorough bath and while still soaking wet Cindy took to the air easily and flew off in search of others of her kind.